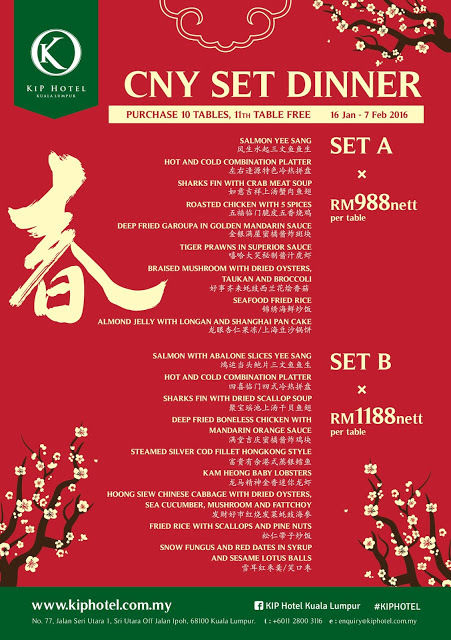 Believe it or not, heading down to Selayang for a Chinese New Year menu launch was definitely the first. 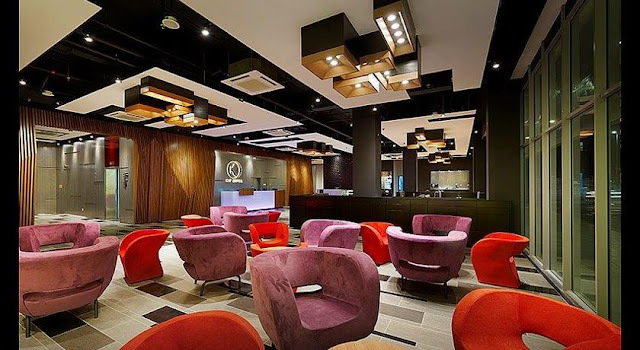 KIP Hotel, the latest business class hotel situated in the pulsating commercial district of Sri Utara, along Jalan Kuching, celebrates its very first Chinese New Year festivities since opening its doors in October 2015. KIP Hotel - It does look quite fancy. Starting things off with a festive dose of yee sang! Lay on the abolone and salmon! In terms of taste, I think it's quite standard with a luxurious twist of abalone and salmon. Followed by a appetizer-4-way. I'm not sure what do they call this in Chinese, but it comes with marinated Japanese tako, stuffed fried beancurd, a pot of prawns and sauteed vegetables and dumplings, plated with candies and snacks around. I guess this would help kids eat their vegetables, with all the reward system placed beside it. Sharks Fin Soup. Not that it is real sharks fin, but the taste was surprisingly identical. It had a nice depth of flavour, along with a generous amount of scallops, fake sharks fin, crab meat and other condiments. This bowl of soup is definitely one of the better ones out there. Crispy Mandarin Chicken is what I would call it. Slabs of chicken thighs fried to crispy perfection and dause with a light and fragrant mandarin orange sauce, decorated with peeled oranges on the side. The flavours were pretty good, though it was a little sweet for me, but it would go really well with some rice. Hong Kong Style Steamed Silver Cod. Without a doubt, this was certainly the best I've had so far. The cod was not only butter smooth, but fresh as hell too. On top of that, the fish is both flaky and plump, giving that utmost satisfaction upon eating. Definitely worth going for! Apart from the cod fish, the prawns too were absolutely delicious. It's fat, plump, bouncy and of course, fresh as well. The flavours weren't really absorbed by the prawns but licking through the shell then feasting on it afterwards worked as well. In any case, this is one of the fresher ones out there. No, they are not stones or pebbles. In fact, they're a concoction of mushrooms, "fatt choi", sea cucumber and a tsunami of gravy. Good flavour, lovely mix of texture and works really well with some rice. Of course, apart from all the dishes, there needs to be a balance of carbs. Hence, here is a serving of fried rice, lightly browned and served with prawns, sliced cabbage and a certain type of seed. It's not the most 'smoky' fried rice that I've had, but it was decent in flavour. After all, the dishes I've had before this were really flavourful so cutting down a little on the rice worked as well. Last but not least, our desserts. The meal wouldn't be complete or prosperous enough without some cold white fungus soup and, warm sesame balls! Done perfectly, ending a meal with these two was certainly pleasurable. The set that we had was certainly delicious. There were one or two that I may not enjoy as much, but the sharksfin soup, silver cod, prawns and mushroom were absolutely fantastic! The place too is fairly comfortable and bright, perfect for bringing your grandparents too! For an even more enticing reunion, KIP Hotel is offering a complimentary eleventh (11th) table upon purchase of ten (10) tables! Available from 16th Jan 2016 - 7th Feb 2016. So what are you waiting for? Do call in for reservations today!